Success for Ukraine and a landmark win; for the first time a place gained in the quarter-finals of a Women’s Team event at a World Championships . 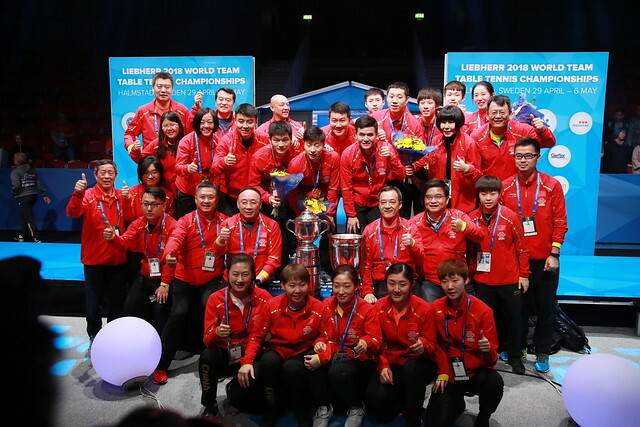 On Wednesday 2nd May, at the Liebherr 2018 World Team Championships in Halmstad, Sweden, the no.15 seeds, they caused a major upset, they beat Singapore, the no.8 seeds and winners in 2010 in Moscow, to book their place in the last eight. The result followed a further upset but less dramatic; on the adjacent table, Hong Kong, the no.4 seeds, had accounted for Chinese Taipei, the no.3 seeds. The win recorded by the Ukraine trio of Tetyana Bilenko, Ganna Gaponova and Margaryta Pesotska was very much a team effort. In the opening match of the fixture, Feng Tianwei beat Teytana Bilenko (11-7, 11-9, 11-2), before in the fourth contest overcoming Ganna Gaponova (11-4, 11-8, 11-3). However, that was to prove the sum total of Singaporean success. In the second match, Yu Mengyu was beaten by Ganna Gaponova (11-6, 5-11, 11-9, 8-11, 11-8), immediately following Li Ye suffered at the hands of Margaryta Pesotska (11-9, 11-7, 9-11, 11-6), before in the vital fifth and deciding contest, Yu Mengyu lost to Tetyana Bilenko (12-10, 11-9, 11-8). It was Tetyana Bilenko who emerged the heroine but she did give her supporters some concerns when she led 10-4 in the third against Yu Mengyu, took a “Time Out” at 10-5 before eventually succeeding three points later. “I made some easy mistakes, I was feeling the pressure, win and we were in the quarter-finals for the first time. I tried to relax and keep defending, my attack is not so good at the moment but Yu Mengyu gave me few opportunities to attack.” Tetyana Bilenko. Few opportunities to attack but ironically it was an attacking stroke that finished the contest; the win recorded by Tetyana Bilenko stole the limelight; the win posted by Ganna Gaponova stemmed the Singapore tide and made the golden moment possible. Most certainly Ganna Gaponova was in form and had every right to feel confident; the previous day against Hungary she had beaten both Georgina Pota and Dora Madarasz in a three-two win. Matters level, Margaryta Pesotska swayed the momentum in favour of Ukraine by beating Lin Ye. A hard fought win for Ukraine; it was similar for Hong Kong who avenged the three-two defeat suffered two years ago at the Perfect 2016 World Championships in Kuala Lumpur when they had lost to Chinese Taipei at the quarter-final stage. Star of the show was Doo Hoi Kem; in the second match of the fixture she beat Liu Hsing-Yin (13-11, 11-8, 16-14), in the fourth she accounted for Cheng I-Ching (11-6, 14-12, 11-9). The one further win for Hong Kong was secured in the third match of the engagement when Lee Ho Ching beat Chen Szu-Yu (11-8, 11-4, 11-8). The one success for Chinese Taipei came courtesy of Cheng I-Ching. In the opening match of the fixture, she recovered from a two games to nil deficit to beat Minnie Soo Wai Yam (8-11, 7-11, 11-6, 11-4, 11-7). A fine effort from Doo Hoi Kem, understandably it was a performance that delighted Li Ching, the national coach sitting courtside. At the quarter-final stage Hong Kong meets Romania, Ukraine opposes Japan.